Tomorrow is my father-in-law's funeral. Neither the Wee Guy nor I will be there - mr ebb is saying our goodbyes for us. We've talked through this inevitable part of life over and over - it's part of the glamorous expat life we lead, being apart from family - distance and grief. So from eight hours and 8000km away, goodbye Derek and thank you. 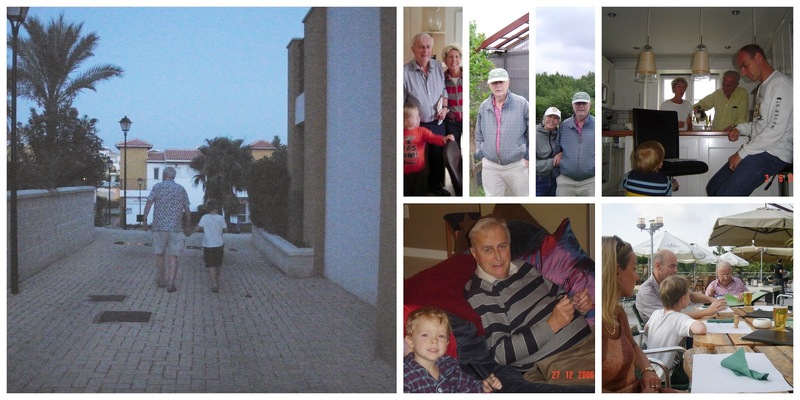 Thank you for being an outstanding and amazing grandfather to the Wee Guy - he didn't see you very often but you made your mark on him. He talked about you, about the holiday in Spain, seeing you last year at Spring Break and when you visited us over Christmas one year. Thank you for being a father to my husband, for sharing him with me and letting me take him away from you. Yes, I know you felt what a lot of parents feel - bewilderment and gratitude; why on earth would a seemingly rational adult want to take on my son, but thanks for taking him off my hands. I did, I have done so and will continue to. mr ebb and I have our rough patches to get through - it's par for the course in being together for so many years, but from knowing you I'm confident that he's worth the effort; I've seen the template - he'll grow up just fine. And lastly, thank you for being my father-in-law, a most wonderful father-in-law too. Thank you for being bewildered and grateful, for being a gracious gentleman while I was still learning to be gracious back, for sharing your strange views on Scotland and its status within the UK and for being willing to neither concede your stance nor belittle my views on the latter, for treating me as an adult rather than a child, for calling my dog "Dog!" whenever you saw him even though he was an utter pest, for being attentive and grandfatherly with my Wee Guy, for introducing me to sandalwood soap, ... thank you. I will miss you - we all will. I watch this video and listen to this song over and over and over again. The skiing seems effortless; the lyrics speak to me. Enjoy! then check out this supersweet acoustic version minus the glowsuits and the skiers. Though I'm not officially taking part in Veronica's Spring Break Drawing Challenge, here's the link to find amazing work by awesome artists who did complete a piece.